Buffett Scorns Gold. Bad Move! HomeBusinessBuffett Scorns Gold. Bad Move! But investors don’t buy gold because they hope it will produce something. They buy gold because they know that no one can produce it. Therefore, the more that folks distrust their national currency, the more they put their trust in the ultimate currency: gold. The gold price has increased for 11 consecutive years — a time frame during which, coincidentally, it has trounced the investment return of Berkshire Hathaway. Why? Because a new era of monetary destruction is unfolding throughout the Western world. That’s why a growing number of investors are devoting a growing percentage of their investment portfolios to gold and other hard assets. Nevertheless, the American community of gold lovers remains miniscule by comparison to the community of Berkshire Hathaway lovers or Apple lovers. 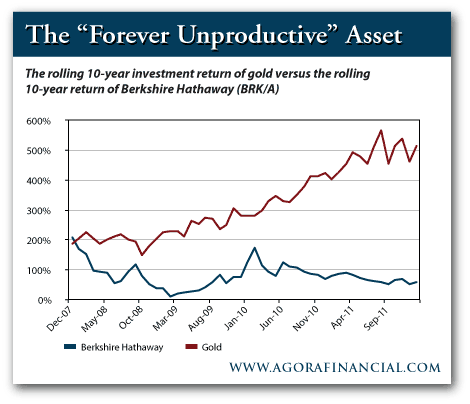 In this sense, Buffett is thoroughly average — he hates gold just as much as the next guy. Interestingly, however, Buffett is one of the very few billionaires on the planet who scorns gold. In fact, several billionaire investors have disclosed recently that they are taking the other side of the Buffett “sell” on gold. George Soros, the billionaire founder of Soros Fund Management LLC, raised his stake in the SPDR Gold Trust (GLD) to 85,450 shares from 48,350 during the last three months of 2011. The billionaire hedge fund manager John Paulson also holds a large stake in GLD. One final admirer of gold is neither a hedge fund manager nor a billionaire. This admirer is a trillionaire! Literally. In 2011, China became the No. 1 importer of gold. China was already the world’s leading gold producer. The Asian juggernaut also reduced its holdings of US government securities last year for the first time since the Treasury began keeping the data in 2001. As of Dec. 31, China held $1.15 trillion in Treasuries, down from $1.16 trillion at the end of 2010. This reduction doesn’t sound like much, but it’s the trend that’s telling: gold up, Treasuries down. China is not only the biggest importer of gold, it is also the biggest miner of the precious metal. According to the World Gold Council, China produces nearly 50% more gold (about 300 tons per year) than the second-place country… Australia. And not a single ounce of that newly mined gold leaves the country. By law, the Chinese government buys every ounce of gold that surfaces from a Chinese mine shaft… no matter what. 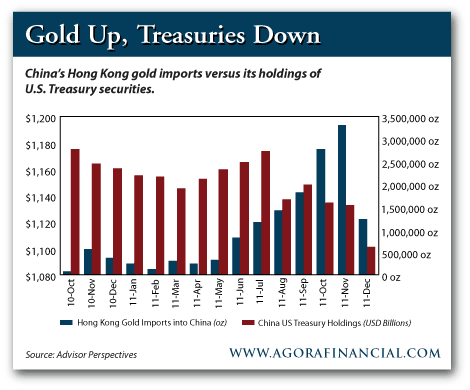 Clearly, the Chinese are taking the “long view” when it comes to gold accumulation. They believe they can trust gold more than US Treasuries. Maybe Soros, Paulson, Gross and the Chinese are all crazy to buy gold. Or maybe Buffett is crazy not to. Place your bets!